The Harris Paints Andrew Phillips Memorial Stages, hosted by the Vaucluse Raceway Motor Sports Club (Barbados) (VRMSC) is the first ever single-venue special-stage rally held in Barbados. 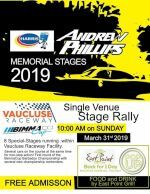 The Andrew Phillips Memorial Stages is open to all classes of rally and race cars and is the first round of the BimmaCup BB Championship. For this speed event no public roads will be closed. This style of rallying involves several cars on the same course at the same time with traffic splits and merges. The action starts at 10am with four special stages of 4.5Km each. There will be a lunch break around 1pm and a 2pm re-start with four more special stages of 4.5Km each. The Prize-Giving and Season-Opening Party is expected to start at 5pm in the Vaucluse Raceway Clubhouse. The north and south drive-in spectator areas will not be open. Food and Drinks on sale by East Point Grill.